Not only did Dell unveil the Dell Streak 7 at its CES press conference, but it also offered a sneak peek of a new 10.1-inch model to go alongside the 7 and existing 5-inch Streak tablets. The Streak 7 is rather similar to the Dell Streak 5 (as it would seem to have been rebranded) but it differs in one crucial way – it has a dual-core version of the Nvidia Tegra processor. 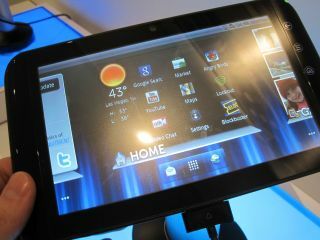 The Streak 7 is also a 4G tablet. Since we don't have 4G networks in the UK as yet, you might think that it won't appear in the UK, but the tablet will be available elsewhere too. Like the Streak 5, the Streak 7 also features Gorilla Glass and has full Adobe Flash 10.1 support. As you'd expect there's Bluetooth and Wi-Fi alongside the cellular options, plus front and back cameras. The size seems a little strange at first sight. It seems quite compact for a device that sits in between the original Streak and the iPad – indeed it doesn't really feel big enough. The Streak 5 may feel like a big phone, but this is kind of a halfway house. Dell is positioning it as a "family tablet," but if for the home we're not sure why you'd plump for it over a 10-inch tablet. Naturally Dell knows this and will make its 10-inch play in the near future – and surely you'd be looking at this size of device if you wanted to play back content on your tablet. And, as a tablet designed for media, we're definitely disappointed by the meagre 800x480 display. Dell will have to up its game here for the 10.1-inch variant. Dell Stage is a very interesting user interface – it seems it will appear on a whole plethora of new devices, though it will be interesting to see if it sells much content. New content services have a lot to prove, especially when they come from companies you don't expect to be offering content. Like the Streak 5, expect the Streak 7 to be available from a carrier partner as well as directly from Dell.